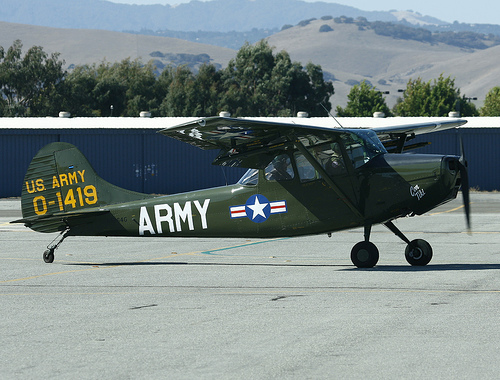 The Cessna L-19/O-1 Bird Dog is a liaison and observation aircraft. It was the first all metal fixed wing aircraft ordered for and by the United States Army since the U.S. Army Air Forces separated from the Army in 1947, becoming its own branch of service, the U.S. Air Force. The Bird Dog had a lengthy career in the U.S. military as well as in other countries. One Continental O-470-11 flat six piston, 213 hp (159 kw).